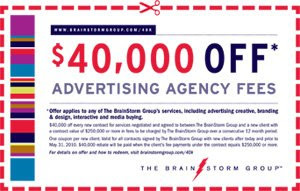 The Brainstorm Group wants to give you $40,000 off your next ad campaign. If you spend $250,000, that is. The Toronto agency, according to the Globe, wants "to demonstrate that you can make some great noise advertising in a down market." The ad, with its oversized coupon, were certainly noticeable. No doubt, this is a great way to get publicity (the ad also garnered a Globe article in the same paper) and raise the agency's profile, but will it attract new clients and - if it does - make them more "discount prone," like all sales promotions?